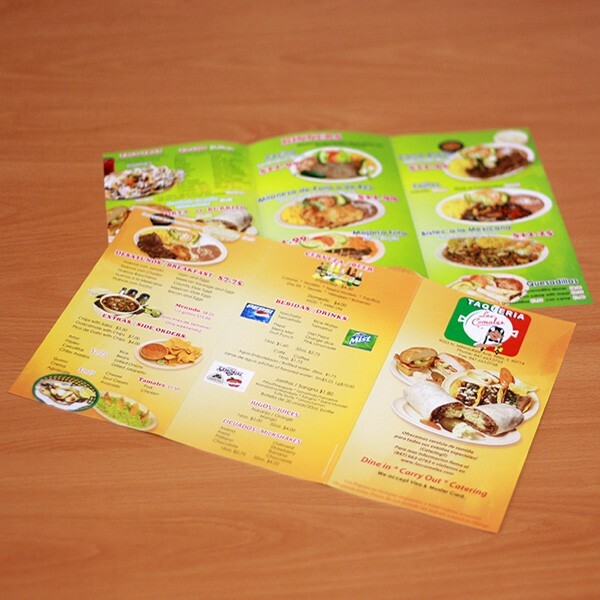 Our carryout are full color printed 2 sided on 80lb text with aqueous semi-gloss finish. Below, select a size and quantity, choose your options, then upload your files. Scroll toward the bottom for complete product standard features & specs, options & upgrades, design requirements, and design templates download. • Available Sizes: 8.5"x11", 8.5"x14" and 11"x17"
• Full color front and back. • Ships in 10 business days. • Rush service, order ships in 10 days. Your files should be prepared in CMYK color mode, 300dpi resolution. You may save your files in PDF, JPEG, Photoshop, Eps, and Ai format. Fonts - you must create outlines to all text to avoid missing font issues. Do not send fonts with your files. Bleed - your layout should provide at least 1/8" (0.125") bleed on all sides. A 8.5x11 brochure for instance, your overall layout size should be 8.75x11.25, while the important elements and text should be kept within 8.25x10.75 to avoid being trimmed. Optional Upgrades - these files should be prepared and submitted separately from your print files. © 2000-14 American Color. All Rights Reserved.